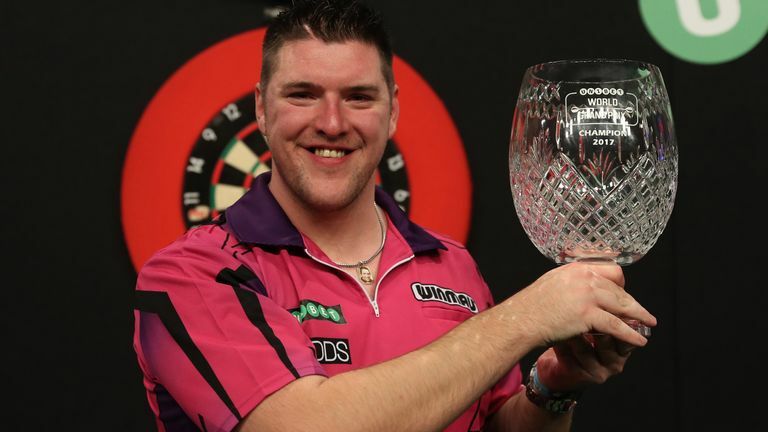 When Daryl Gurney is called to the Citywest oche by MC John McDonald on Sunday it will be as the reigning and defending World Grand Prix champion - Paul Prenderville spoke to Superchin on the emotion of his first major title and the journey since. Saturday October 7, 2017. Gurney sinks to his knees in tears after a nerve-shredding 5-4 victory over Simon Whitlock sees him claim a first major title. After lifting the trophy Superchin spends the evening celebrating with friends and family, playing pool with the younger members of Team Gurney and eating pizza. "I cannot believe it is a year ago already," he tells the first episode of The Darts Show podcast which you can download and listen to right now. "I still remember the lead up to every single game, going to get some food, my preparation I just wanted to get everything right. "And then playing terrible pool, eating pizzas with everyone it was just a great nine or 10 days and I'll say it again I can't believe I'll be back there this weekend." Not only was it a major breakthrough for Gurney but it happened on home soil. Neil Diamond's 'Sweet Caroline' welcomes Superchin to the oche but rarely can it have been received with such gusto as last year's final, but Gurney is quick to play down the significance of a 'home' major. He said: "To be honest Dublin is four hours drive from my house so it's not exactly on my front door, but I only get a few chances a year so it's nice to play the Premier League in Belfast and Dublin and then the Grand Prix too. "I have been playing a long time name, both in the BDO and the PDC, travelling to the south of Ireland regularly so it's no big difference to me. "The best part is playing in a venue where I don't have to get on a plane, getting down the Citywest and staying in the same hotel with the rest of the players. Gurney's journey to major champion had been coming. The world No 5 had enjoyed the most consistent of years - starting with the World Championships where he reached the last eight for the first time. He went on to reach the UK Open, European Championship and World Matchplay semi-finals as well as the quarter finals of the Grand Slam and Players Championship Finals - with his Grand Prix title in amongst it all. It's easy to forget that up until the end of 2016 and his Ally Pally run, Gurney had just a solitary major TV semi-final place under his belt having moved across from the BDO in 2013. He won the Irish qualifier for that year's Worlds and went on to secure his PDC Tour card via Q-School in 2013. This year Gurney heads to the Citywest Hotel in not quite the same form - he is yet to reach the last eight of a televised major but having still enjoyed a year that underlines his journey, including the birth of his son. He finished fifth in his debut Premier League campaign and at the weekend became the first man to be knocked out of the Champions League having won two games, including a win over the eventual champion Gary Anderson. It's been that sort of year for Gurney, who feels he is on the cusp of regaining his form from last season. "I think I am playing well but last year I was taking just one dart to finish some legs - crucial finishes really and that's been the big difference. "I am only a dart or two behind of how I was performing last year and this time of year it's about putting the extra practice in and then hopefully defend my title." He has played in the Premier League for the first time, toured the globe for Shanghai and Las Vegas in the World Series - it's a schedule that needs some adjusting, as the world champion Rob Cross told us earlier this year, but Gurney is happy. "I had four or five weeks off in August but as soon as I threw the first dart back I knew that was me until January, it's been that way for the last couple of years and will be again this year," he said. "It's the busiest time of the year but it's the best time of year - from here on it can feel like absolute madness but if you are playing darts every week then it's a good sign and it all leads to the Worlds in December. The nostalgia will be flowing on the outskirts of Dublin for Gurney and as if McDonald's familiar tones announcing his status was not enough, the man facing him on Sunday night will be another familiar face. "I had a great game against John - the first two sets were tight but I won them and then he destroyed me in the third," Gurney said. "This year, it's the first round so it's best of three and John is quite capable of going up there and destroying me again but I'll be getting ready and I'll be up for the fight. Big John's presence will be reminder enough of the fate that can befall the seeds. The Scot beat Michael van Gerwen in the first round and a host of names have crashed out to more unfancied stars as the double-to-start and quickfire nature of the first round serves as a wake-up call. "In some tournaments, you can go up there and know that event if you lose the first two or three legs then you still have time to get going, " Gurney said. "It's in the back of your head that it's a short format but you have to be ready for the 'Game On' and whether it's your night or night, you have to wait and see but preparation doesn't change." It was his night 12 months ago, and so 12 months on, when John McDonald says the reigning and defending champion, what will Gurney be thinking? "I hadn't thought about that until you asked, but it's put a smile on my face," he said. "It will be great to hear it, but now I have got to defend it [the title] and then hopefully with friends, family and now my wee boy, I'll get through the first round and hear it in the second." Seven days of coverage from the Citywest Hotel gets underway on Sky Sports Arena from 7pm on Sunday.